Call for nominations for our 2015-2017 Council have been open for two weeks now and we continue our journey through the experiences of our current Council members. Dave Deruytter, longstanding member of Council, has kindly shared the story of his time in the British Chamber family. For more information on the Council nominations process and timeline, please follow this link. If you’re interested but want to know more about being a Council member, or standing for President, contact Glenn for an informal discussion. I first joined the chamber about 10 years ago, after being introduced by Ackroyd Publications, and was immediately impressed by the great network of members the chamber has. The dynamics of the chamber took me aback too – full of entrepreneurship and inclusivity. 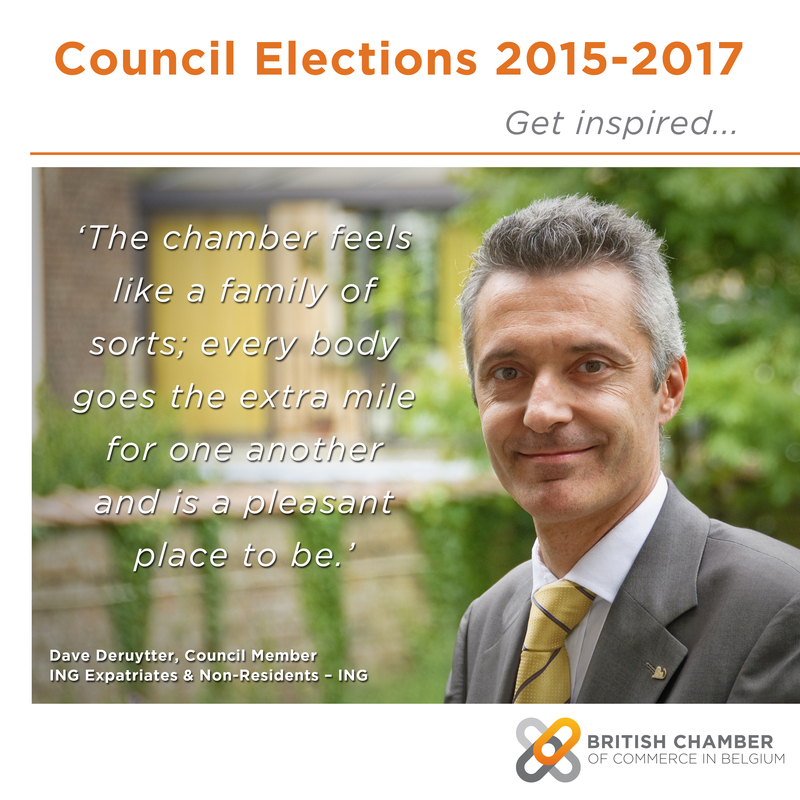 From being the longest standing chamber of commerce in Belgium, the British Chamber has evolved into a truly international organisation where people of all nationalities and all walks of life, are and feel welcome. The best way to get involved with the chamber is to participate in its events and committees; the more you put into the chamber, the more you tend to get out of it. Being a part of the British Chamber has been a great experience for me. Not only did I directly involve myself in the planning, running and organisation of the chamber through the Council and as a member of the Tax, Finance and Legal (TFL) task force, I also involved myself in the network that the chamber has. The British Chamber has allowed me to connect with other members who are part of the large international business community here in Brussels. The EU Committee is a significant part of the chamber, a real gem. However there is still a lot more that the chamber offers to its members. The Business in Belgium committee and the TFL task force are important too and organise some very interesting and unique events. The Expat Financial Affairs conference, first organised two years ago and now in its third year, welcomes over 200 expats to come and listen to finance, tax and legal experts and get insights about living in Belgium. The advice ranges from real estate to investment, from social security to pensions, estate planning and taxation of professional income. It’s the only event of its kind for expats in Belgium to gain valuable financial and legal insights. The chamber offers a very complete package to any business person looking for a trusted, expansive network in Brussels. I have spent almost 10 years of my life as an expat abroad and coming back to Belgium, working for ING as the Head of Expatriates and Non-residents, the chamber allows me to keep in contact with the international community and that is beneficial for my role at ING. The chamber has always been well structured, proactive and professional. During my time I have seen an important involvement from the members into how the chamber is run, and the business strategies have been built using input from the members and what they want to see happening. This has helped the chamber to evolve positively and it resulted in an ever increasing attraction to be an active member of the “British Chamber”. This was confirmed by the fact that in the last presidential election, in 2011, there was, for the first time to my knowledge, more than one candidate for the job. It underscores that the chamber has gone from strength to strength. Being able to attend Council and to be an integrated part of the chamber, involving myself in its innovative and creative vision and events, I really enjoy my time. The chamber feels like a family of sorts; everybody goes the extra mile for one another and it is a pleasant place to be.